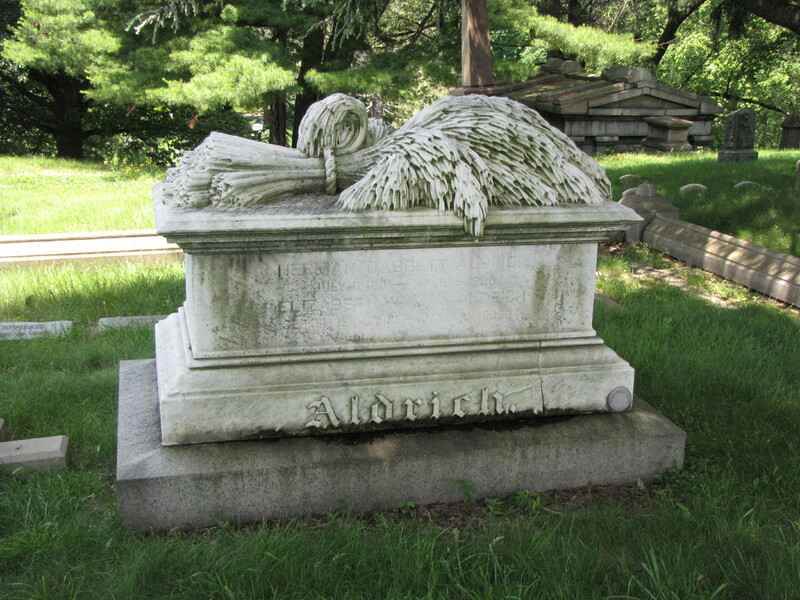 Carved on top of this white marble monument for Herman and Elizabeth Aldrich in the Green-Wood Cemetery at Brooklyn, New York, is a great shock of wheat. Wheat’s origins are unknown but is the basis of basic food and a staple in many cultures. Because of wheat’s exalted position as a mainstay foodstuff, it is viewed as a gift from Heaven. Wheat symbolizes immortality and resurrection. But, like many symbols found on gravestones, they can have more than one meaning. For instance, because wheat is the main ingredient of bread, the sheaf of wheat can represent the Body of Christ. Wheat can also represent a long life, usually more than three score and ten, or seventy years. In this particular case both Herman and Elizabeth lived a long life, well past 70.